At HTG we have long experience, dating back to the early 1990’s, of solving conservatory problems, installing new roofs, and roof upgrades to enable our customers to enjoy their conservatories in comfort throughout the year. We pride ourselves on our technical expertise to the extent that the person that visits you to inspect your conservatory and to prepare a quotation is also an experienced installer. Who has a sound knowledge of the structural elements of the conservatory, a wide experience of the various manufacturers’ models, many of which are now obsolete, and knows how our products are applied to old and newer conservatories. This is essential because we are dealing with an existing conservatory that needs to be worked upon. This knowledge can only be gained from a long experience, and this is a key element in our success. The high performance materials that we employ have been developed in house and we have pioneered many unique innovations. 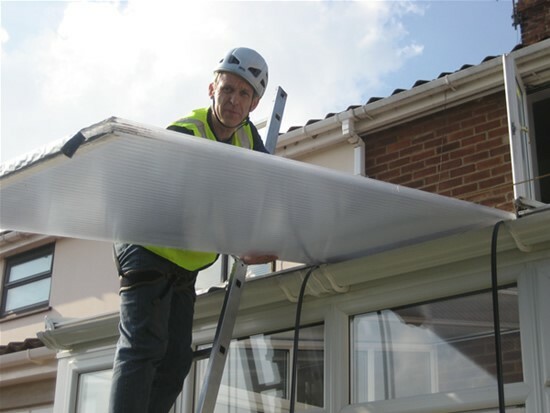 In particular the patented transparent heat reflecting technology that we apply to both Glass and Polycarbonate roof panels, components and techniques we use to upgrade existing conservatory roofs without the need to replace, Optical laminates for applications to all types of glazing, Crystal clear Ultra-violet filters to protect against fading, and our one way vision safety and security products. We pride ourselves on being second to none in product performance, customer service, and value for money. Based in Watford our installation service covers: London and the South East and Home Counties, Central England west to Bristol, and North Somerset and Gloucestershire, Central and East Midlands, Northants, Bedfordshire, Oxfordshire and Cambridge. Outside these areas we can only supply DIY products. Managing Director David Anderson, he has over twenty-five years’ experience in installations and also on the Technical, Marketing and Administration side of the business. Our Installations Team leader is Jamie Mulvaney; his experience spans a period of over fifteen years. We manufacture our high specification roof panels, and unique patented transparent heat reflectors, at our factory in Chesham, near Watford. This enables us to supply our customers with the highest performing conservatory roofs available from any manufacturer. We also manufacture specialist heat and light reflecting panels and sheets for agricultural, factory, and other premises. Conservatory Refurbishment, improvement and repair work requires experience to diagnose and specify what is required, and specialist materials, to undertaking the work. For example: to make in-situ flashings on low pitch roofs, linings for valley gutters, modifying existing glazing bars to accommodate high performance roof panels, undertake leak repairs to all elements of the conservatory, that are permanent and solve the problem, secure slipped panels, etc. The Team at High Technology Glazing have experience dating back to the early 1990’s in all areas of Refurbishment, repair and improvement of conservatories, and we have the training, skills and experience needed to produce the high quality of work that you expect. Over these twenty five years we have refurbished and renovated thousands of conservatories to make them cool and comfortable in summer and warm and economic to heat in winter; improvements that have enabled families to increase their living space by incorporating their conservatories into their homes. In addition we have solved leaks problems and made repairs that have brought conservatories to a good standard of maintenance, transformed the appearances of conservatories to look as new, provided improved light, and all of this at an economic cost without the need to replace the conservatory. The nature of our work is far more technical than for example installing a conservatory, which is often kit-based. It is for that reason that anyone that will visit you from the company is an experienced installer, who will be on the fitting team if you decide to go ahead. So that we can give you the best quality of advice and provide a quotation that best fits your needs. After the visit we will send you a report that details the Condition of your conservatory, our recommendations and specifications, and prices. This is an important document because it explains how we will achieve the improvements that you seek, and also it is an unambiguous statement of the work we will be undertaking. At the end of the report is a form that you can complete and return to us in a pre-paid envelope if you decide to go ahead. We supply you with two copies one of which you retain so that we both have copies of the work to be undertaken.